I'm hoping some folks more familiar with the R154 can help me out here. I bought a car with a turbocharged 2JZ-GE. Previous owner had broken the W55 trans and swapped in an R154 he said came from Marlin Crawler. Claim was 5000 miles on the trans. I've not found any evidence of the previous owner lying about anything, and the trans looks brand new - so I believe it was recently redone. It seems there are 1000 different tailshaft/shifter variants on the R154. Not certain which this one is, but nothing was chopped/welded to make the shifter fit... It has a Ralco shifter installed. Regardless whether engine is running or not, the shifter doesn't go into ANY gear easily. Kinda gives feeling like trying to select gears when the clutch is not fully disengaging - really gotta force it to go. But again, it feels this way engine running or not. Also, I've checked to be sure the clutch is in fact fully disengaging. It is. Changing up into 4th from 3rd, or changing down into 4th from 5th - you must be VERY deliberate and shift like you really mean it to successfully engage the gear. If you don't, it'll feel like the it went in (as well as it ever does, anyway), but when you re-engage the clutch sometimes you get a grind, other times it'll kick the gear out. Both of these symptoms indicate to me the 3rd/4th dog slider is not fully coupling with 4th gear. At no time does the transmission grind when attempting to select gears. The only grind I've experienced is upon re-engagement of clutch after *thinking* i'd selected 4th. When selecting 4th while driving - if you do not immediately attempt to engage 4th (whether changing up or down), it becomes impossible to select. So you are coasting down a hill at 60mph in neutral... If you blip the throttle to 2500rpm, dab the clutch and attempt to select 4th - it won't go in regardless how much force you put on the stick. I've tried this 20 times and only been successful once. No amount of rev-matching, double clutching or force seems to work. Don't know what i did that one time that made it actually go. The trans has fresh RedLine oil in it. I've made sure my clutch is fully disengaging. I've ensured the shifter itself is not restricting the internal shift rail's travel. I've ensured the little ball/bushing on the bottom of the shift lever is fully engaging the receiver on the end of the shift rail. Doesn't seem like a synchronizer thing because I'm experiencing no grinding when trying to select gears. Doesn't seem like a bent/broken shift fork because 2nd, 4th and R all have the vague/undertravel feeling. And if the 3/4 fork was bad - wouldn't I be experiencing 3rd gear strangeness too?? Thoughts on this? I'm all ears! My first guess is it is the Ralco short shifter, read similar reviews with shifting issues. I would start with replacing the bushing on the bottom of the shifter, to see if that doesn't help, a lot of aftermarket parts are "close to specs" but close often isn't the same, or try to source a stock 154 shifter. Don't see how the shifter could be causing this...? It feels like the 1/2 (and 5/R) shift fork is not able to move far enough forward to completely engage the gears. Which is why I made sure the shifter itself is not preventing the internal shift rail from completing it's travel. When pulled as deeply as possible into the 4th gate, the shifter is not out of swing travel. The distance between the base of the shifter and the end relates directly to how far the shift forks move forward and back, if this distance wasn't maintained with the short shifter, the forks wont move as far as they are supposed for the gears to engage. Researching the Ralco shifter I couldn't find anything for it regarding the an MKIII Supra, just the MKIV, if it was designed for the Wseries, that would explain why the forks don't move far enough. You might try shifting it into gear, then remove the shifter and see if you can move still move the selected fork more, if you can it would indicate the short shifter isn't designed correctly, if you can't, then that would indicate something with trans. The distance between the base of the shifter and the end relates directly to how far the SHIFTER IS CAPABLE OF MOVING THE shift forks forward and back, if this distance wasn't maintained with the short shifter, the forks MAY NOT BE ABLE TO move as far as they are supposed for the gears to engage. My point is that my shifter, even with reduced travel as compared to OEM (which is the nature of ALL short shifters), is not limiting the motion of the internal shift rail; there is something else internal to the trans that is limiting the motion. If I remove the shifter and watch how far it can swing fore/aft, then compare it to how much it swings fore/aft when actually installed; I can see that it has some travel left. In my case, the shift shaft/fork is coming to a stop before the shifter runs out of travel... Which is why I don't see how my shifter could be causing this. But, point taken. I have a W55 with a stock shifter in my other car. Tonight I will pull it off and stick it on the R154. I don't expect it to help, but it's easy enough to try that I definitely should. I will report back after I test this. Given Toyota's design, if the forks aren't traveling far enough to engage the gears, there would have to be something blocking the rails in both directions, or the rails being used were not the right ones, which both seem unlikely. While you are at it, install the ralco and see how it feels in the W55. How does it act when you aggressively shifting through the gears, i.e., like you are at the track or pushing it on a twisty road, reviews seem to indicate it works better when driving aggressively than just cruising around town. While I'm not impressed by the "feel" of the R154 (as compared to every other manual trans I've ever driven... T5, T56, T6060, T10, SR4, 3550, 3650, T45, TKO, etc etc etc), it seems to engage every gear just fine (including 4th) provided you shift it like you really mean it. The thought of ~400lbft being transferred by a halfway engaged gear makes me sick to my stomach! If shifting with authority works in all gears, than it is likely the shift lever itself, as the amount of leverage you have is reduced with both the short shifter and a short throw shifter over the oem one. Before you swap the shift levers, you might slide something over the ralco that makes it longer, increasing the amount of leverage, and see if it shifts easier. I wouldn't force it it of doesn't, came across a thread where the lever broke after 2yrs of use while shifting into first to leave from a stop. Last night, I swapped the shifters. My W55 shifter had been modded, and wouldn't clear the console in my r154 car - so I had to modify the W55 shifter again. Aside from it being a bit too far back in the car, the shift feel is way way better than with the short shifter. I can feel the engagement of each gear much better than before. But... 4th gear is still a problem. If you bang into it very firmly, it engages fine. If you are anything less than FIRM, it doesn't engage. It'll feel like it's in, but when you re-engage the clutch - it kicks it out. Once it's actually in 4th, though, it stays in. In my first post I mentioned that I couldn't hang out in neutral for any length of time prior to going into 4th gear, or else it just wouldn't go in. That's still true, but a proper rev-match gets it to go in fine...just so long as you pull it in FIRMLY. Also tried the Ralco short shifter on my W55. Really hurt the shift feel, but it had no trouble engaging every gear. Note how the ring on the end of the shifter arm (that receives the bottom tip of the shifter itself) is concentric to the shifter bore... I called the outfit (Freed Engineering) that posted these pics on their website. They offer a shifter housing extension service for R154 swaps. Anyway, I asked them if that pictured concentricity was always how it should look in neutral. Dude said "yes". Well you are starting to narrow it down, and given that the issue was more with 2/4/R, and the pic of the r154 in the car, leads me to think it could still be partly a shift lever issue or an issue caused by the shift lever+boots+lack of clearance, that caused the issue. How much clearance do you have between the shift lever and the trans tunnel when in 2/4/R? What may seem like enough clearance w/o the boots on, may not be once they are installed and driving, have experienced similar issue with trucks I have built over the years. If you haven't done it yet, I would leave the boots off and take it for drive and see what it does? If it is still there and lever isn't hitting the tunnel, then it could be the syncro's due to the previous owner not resolving the issue after installing the engine and trans. With engine and drivetrain swaps, the little things always cause more trouble than the swap themselves, and usually cost more as well. It's a bit too tall and a bit too far back - need to modify again, but it worked for testing purposes! With clearance not being the issue, it is likely the syncros due to the PO's set-up, if it isn't livable getting it repaired wont be that costly if nothing else has to be replaced. The 3/4 fork is quite worn, reducing the effective travel of the slider. The 4th gear lead-ins to the dogs on the slider itself are peened and beat up. 5th gear has about .015" endplay, 1/2 fork has about .025", and 3/4 fork has about .075"
Good news is the bearings and gears are all tip top. It's really surprising to me the engagement dogs on the input shaft (4th gear) can be pristine, meanwhile the dogs inside the slider are screwed? Either way, it's obvious the previous owner was banging 3rd and 4th a lot! I think some billet forks, new synchs, a 1st thrust washer and a 3/4 slider will take care of the issue. I'm late to the game but after reading all the posts it sounds like you already have it figured out. If you have any questions let me know. My readings suggest there was a synchronizer design change (for 3rd and 4th) at some point. They switched from an "arrow" shape to a "wedge" shape tooth. Do these different synchs require a specific slider? Or, do both arrow and wedge synchs take the same slider? How to tell if slider is arrow or wedge? What happens if you have a slider/synch mismatch? My trans has the wedge synchs, and it never gnashed or crunched going into any gear. However, I'm pretty sure I need a new 3/4 slider, and wondering if the replacement from MC (or AMP Distributing??) is suitable. Also, curious to get your analysis of "root cause". I measured how much axial end play my 3/4 slider had on the fork last night before pulling the shift shafts and forks apart. I measured .105" - not .0105... POINT one - oh - five. As in a hundred and five thousandths of an inch. Spec is .035 max. My theory is the worn shift fork was under-engaging 4th gear, and because such a small amount of slider tooth surface area was carrying the load, it wallowed out the dogs in the slider. If this is the case, all I need to do is replace the fork, solving the under-engagement issue - and replace the slider, solving the wallowed out issue. As for cause its just a swag but id say the transmission had been abused by 1st owner he/she most likely knew of the issue and sold the transmission because of it. I base this on the huge amount of end play that I would say has been caused by holding the shifter in place while driving down the road/track/strip. By holding your hand on the shifter you push everything out of place and cause very very fast damage to the shifting parts. As for internal details on differences between years. Its company policy to not give out any information on things like that so I cant help you there, sorry. I had several issues to overcome. First, the slider (hub sleeve, is what Toyota calls it) for 3rd and 4th was beat up. Secondly, the shift fork for 3rd and 4th was heavily worn. Thirdly, and probably most importantly, the JZX110 shifter housing that was installed on the transmission was not allowing full forward travel of the shift shaft, disallowing it from fully engaging 2nd, 4th and Reverse. The transmission itself has a shift and select shaft, the shift arm bolts onto the shift shaft, and the shifter itself has a ball end that engages into a socket on the far rearward end of the shift arm. The housing also provides mounting provision for the shifter itself. Instead of a shift arm, there is an intermediate shaft supported in linear bearings within the shifter housing. The intermediate shaft sticks out the back of the housing, and the shifter itself communicates with the intermediate shaft with what is basically a universal joint. In the pic, this is hidden underneath a rubber boot. Rather than a shift arm being bolt to the shift and select shaft, there is a ballstud. The intermediate shaft has a female socket that engages this ballstud. 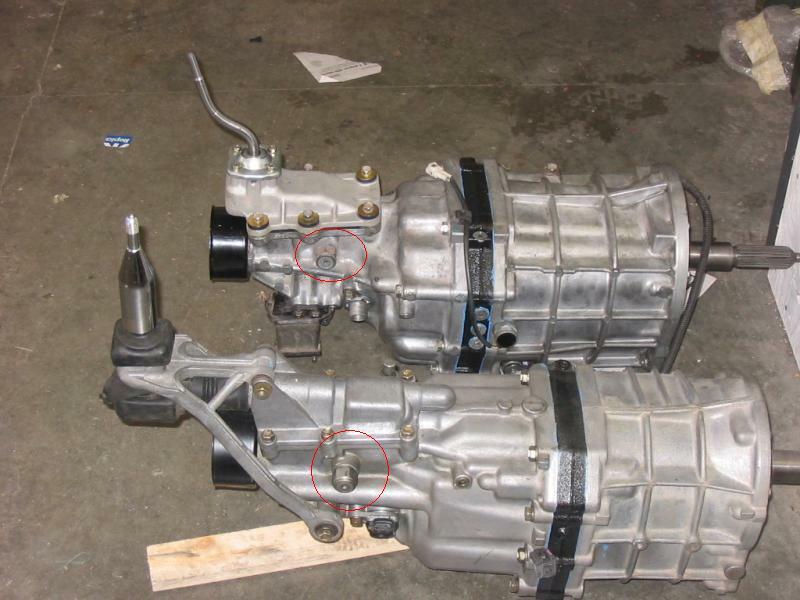 The trouble is that while both early and late model shifter housings have a very similar rectangular 6-bolt flange, they are NOT interchangeable... If you oval-out the holes of the late model housing, it can be made to bolt onto an early model transmission if you align it such that the rear pair of bolt holes are on-center... BUT THE SHIFTING GEOMETRY WILL NOT BE CORRECT. If you oval out the holes and mount the housing with the rear bolt holes on center, the intermediate shaft and female socket block bolted to it will hit the shifter housing before you have moved the intermediate shaft far enough forward to fully engage 2nd, 4th and Reverse. It might feel like it is going into gear. It might even be enough engagement to drive the car - but you will hurt the transmission the same way mine was. Cut ~1/4" off the front of the intermediate shaft. Grind away the forward face of the female socket block so that it can move farther forward before contacting the housing. This required a lot of googling, a lot of measuring, and a lot of fiddle-f&cking to solve. I hope this helps somebody in the future. Also, if you are going to do this, I highly recommend you dowel-pin the shifter housing to the transmission. Ovaling-out the hoes eliminates the ability of the bolts to positively locate the housing on the trans, and you'll be relying on gasket friction ONLY to prevent the housing from moving in relation to the trans. With the housing mounted, I drilled through the housing flange, into the transmission, with a .125" drill. Then I removed the housing and drilled the holes in the transmission out to .135". Then I tapped some 1/8" roll pins through the housing flange. This effectively locates the housing on the transmission. ...As for internal details on differences between years. Its company policy to not give out any information on things like that so I cant help you there, sorry. Want to close the loop on this, also. The "arrow" and "wedge" synchonizers are fully compatible with one another. They DO NOT require a dedicated or specialized slider to match. gma's car acting up?? Ideas to why??? 84 22R acting like its running on 3 cyl. ?